'The Circle' #2 picks up right where the first issue left off. Christian's new group of friends have been very inviting and accommodating to the new kid in town. He's assimilating quite well into this secret club but is there more going on that meets the eye? Battling typical high school crisis, bullies, studies, mourning a deceased parent, Christian finds companionship among the "weird" kids. He soon finds out they're even weirder than expected. With an underground lair and a ritualistic pledging ceremony, 'The Circle' certainly has its quirks. Now, the kids taut "The Event" and everyone must attend. Damon Clark continues to add layers of mystery keeping both Christian and the reader on their toes. 'The Event' turns out to be a significant gathering giving the kids quite a trip. Christian will never be the same again. It would be unfair to spoil the details. Alyzia Zherno’s distinctive artwork gives the series the right dark and quirky appearance it needs. Even though some of the characters have similar facial features, the layouts are dynamic and the earth tone colors contrast well when things literally go black. 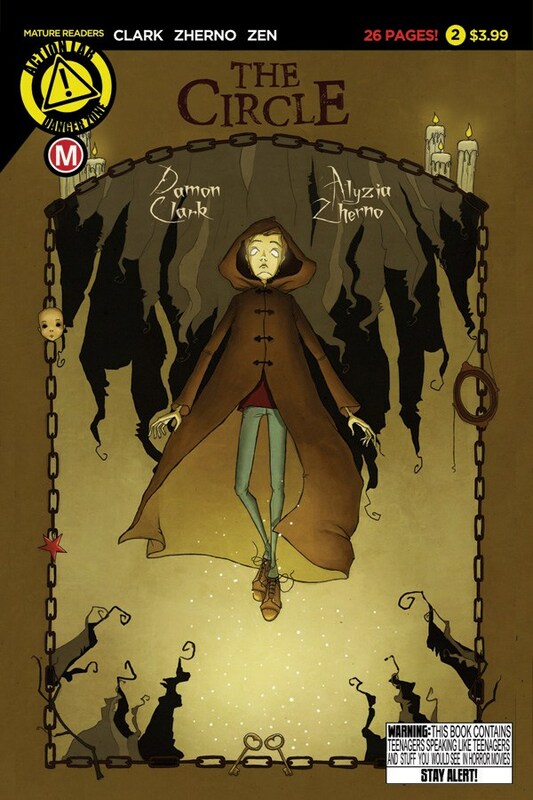 Zherno creates a nice balance the horrors of the supernatural with the horrors of high school. 'The Circle' is an entertaining supernatural teen drama that is finding its groove. The next issue, as with any new series, is the make-or-break point with issue three. So far Clark and Zherno are hitting all the right notes building an intriguing story.